Being considered as The Little Paris of Vietnam, Dalat is by far one of the most attractive city listed in every tours visiting Vietnam. 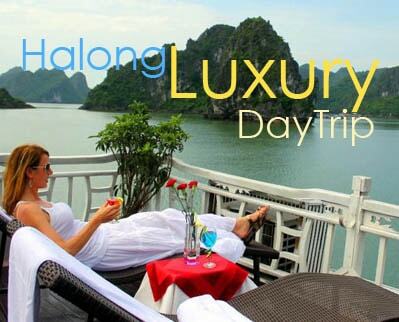 People choose Dalat their stopping destination mainly to relax and enjoy the peaceful atmosphere together with some romantic and charming places. What’s more, Dalat is home to thousands of species of flowers. That’s why it is quite obvious to notice that Dalat Flower Festival is one of the traditional events having branded for the homeland of many hidden charms. Let’s take a deeper look into what’s going on in this festival! Dalat Flower Festival is a unique festival event held in Dalat city, Lam Dong province, Vietnam. It is an opportunity to showcase exhibitions on flowers locally as well as from many regions nationwide and neighboring countries. Held every year, the festival not only attracts numerous tourists but it is also a meaningful activity honoring values of flowers and flower industry to promote and attract investment. On this important occasion, Dalat will be specially decorated brightly than ever with colorful flowers of plateau city. Hundreds of beautiful miniature landscapes, flower baskets, ornamental plants will be scientifically arranged around key of attraction points and main streets including Xuan Huong Lake, Prenn Falls, Le Dai Hanh Flower Street – Ong Dao bridge. Generally held in December and lasted for 5 days, the festival will present different themes each year. Dating back to the first held Dalat Flower Festival on 10 – 18 December 2005, it was such an impressively successful event ever with lots of performances of more than 160 kinds of dazzling flower floats, lavish performing art programs and splendid fireworks display. 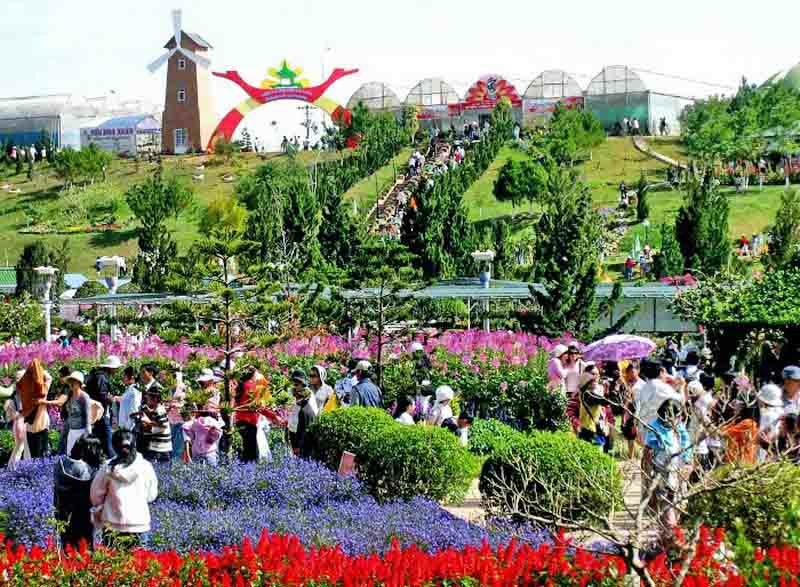 The second Dalat Flower Festival 2007 was held with the theme “Integration and promotion of Dalat flowers”. Success of this festival is enrolling 8 new records in the Vietnam record book – Vietkings. Next, on the occasion of Thang Long – Hanoi 1000th anniversary, 3rd Dalat Flower Festival was held from 01 – 04 January 2010. The colorful space, shimmering and brilliant flower paths attracted any demanding visitors. Also, in this occasion, Dalat has officially welcomed the decision of Prime Minister on recognizing Dalat as the first city of flower festival in Vietnam. 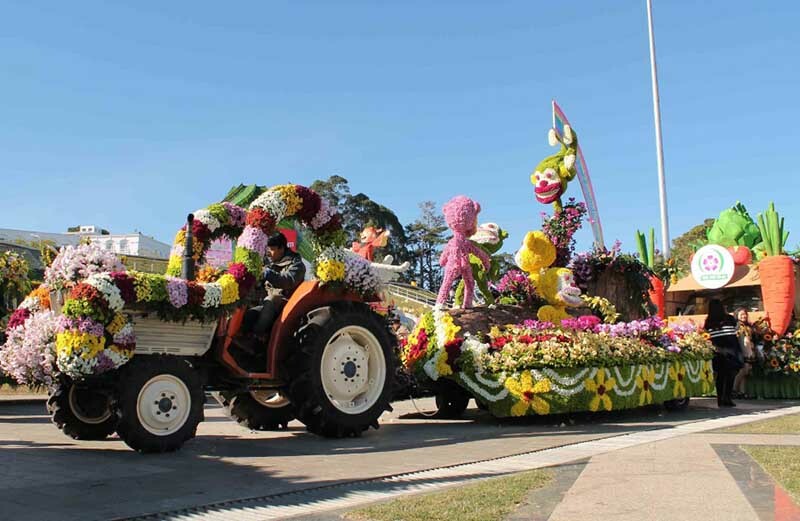 The 4th Festival 2012 was held with the theme “Dalat – the City of Flower”. The festival impressed by showcasing programs, parades, flower market, flower Culinary Festival, and scientific conferences. 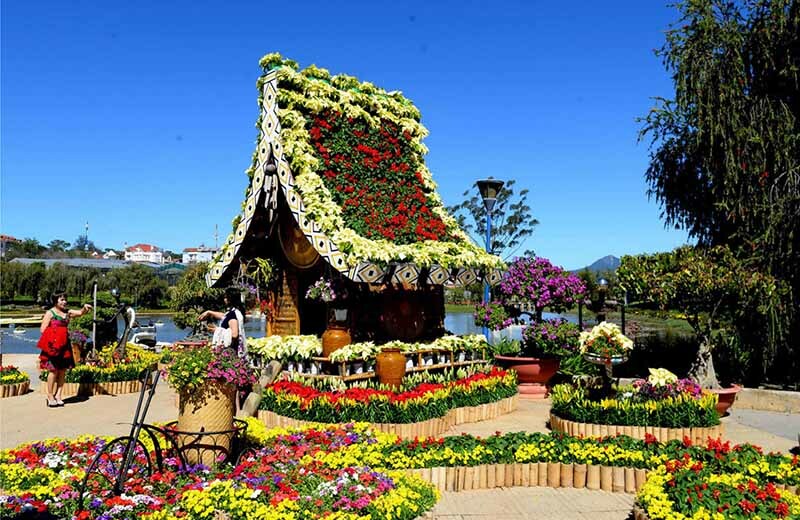 The 5th Dalat Flower Festival 2014 introduced visitors the most renowned flowers of the cold country. “Night of converging Dalat Flower” would be a major rendezvous with performances of flower fashion, flower carnival, street parade, and flowery bicycles, exhibition of unique temperate flower species of Dalat… This is also the 120th anniversary celebration of the founding of Dalat city. The last two festivals recently was held in 2016 with the theme “Dalat – Multitude of flower colors” and in 2017 from 23th December to 27th December having a beautiful theme “Da Lat Flowers – Miracle from the good earth” which has just been successfully finished. The program in Dalat Flower Festival will be rooms of many marvelous activities, namely exhibitions on unique mementos of Dalat, Vietnam – Asia – Dalat tourism fair, costumes of Central Highland indigenous peoples, Carnival, brocade art festivals, excellent dance music, laser light performances, artistic fireworks, Christmas-Eve festival with many fun activities and fascinating entertainments such as Christmas tree decoration, loving dances, perfect couples, or receiving gifts from Santa Claus… The festival in national stature marks an important step of formation and development in Dalat in general and Dalat tourism in particular. 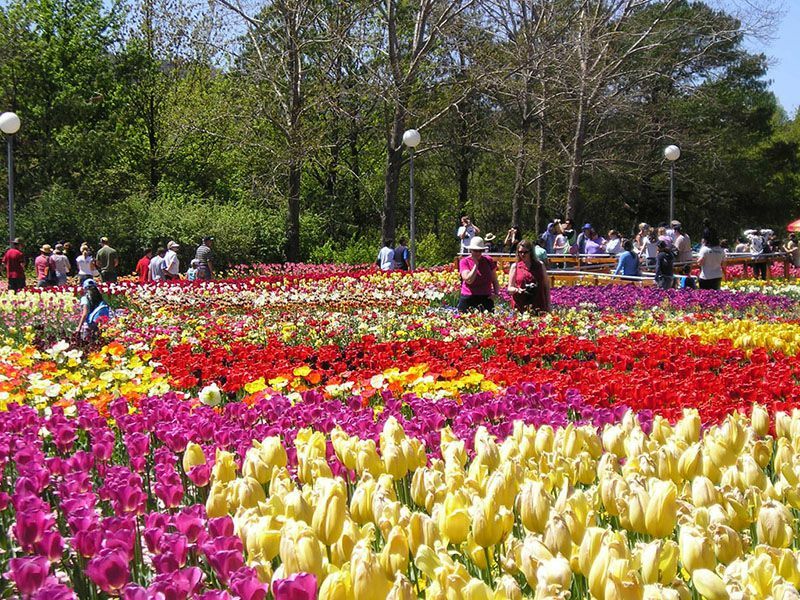 Dalat Flower Festival is definitely a suitable opportunity for flower growers as well as those having a passion for flowers to meet and communicate with each other, also have a chance to view some of the most amazing unique and wonderful flowers ever seen. Plan your trip to Dalat now, you might want to travel during the next flower festival in this romantic city of Da Lat. You will not feel regretful at all!